My Mum used to make this on Sundays for breakfast. What a treat it was, sweet apple slices make a simple grilled cheese sandwich taste gourmet. Place the slices of bread on baking sheet. Top with sliced apple and grated cheddar cheese, few twists of black pepper on top. Place it under the grill until cheese has melted, approx. 2-3 minutes or until it’s golden and bubbling. Summer is over (although I do enjoy the continued good weather, which it is at the moment), I’ve been busy lately and completely neglected my blog. I’ve been cooking a lot and collecting recipes to share, but some of them are not relevant anymore,(think strawberries, and I do try to be as ‘seasonal’ as I can). Also my mind is already set on Autumn, so I’m going to forget, well I mean to file some of my summer recipes till later and jump straight into the Autumn audition..
One of the things I absolutely love about this time of year, is the APPLES! I love them as they are and I love anything with apples. Here is one of the simplest ways to enjoy apples. 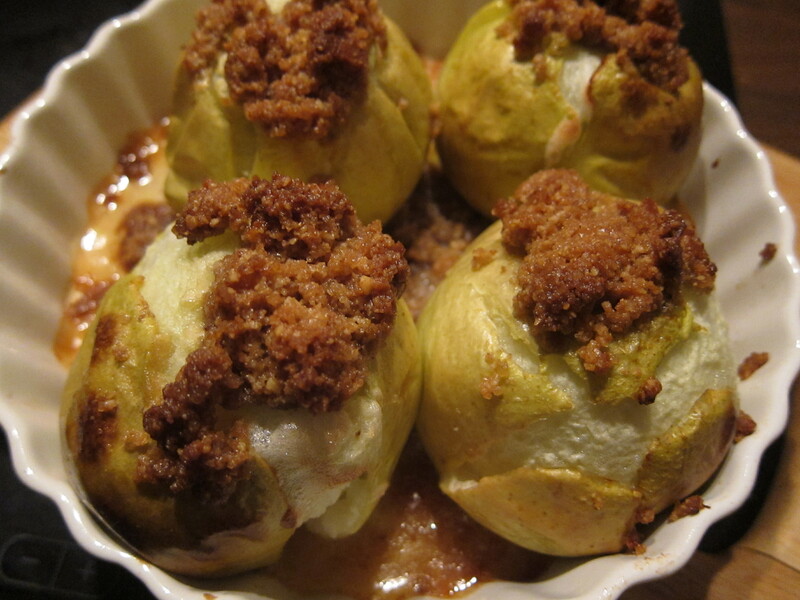 Baked apples are so easy to prepare, but my filling makes them more exciting. Use an apple corer or a small knife to remove the cores from your apples. Place the apples in a slightly buttered baking dish. Crush the biscuits, using the rolling pin until the mixture resembles wet sand, add butter, brown sugar, chopped walnuts and orange zest, mix until everything is incorporated. Stuff this mixture into the hole in each apple (where you removed the core) and rub the outside of each fruit with some of the leftover mixture. Place in the preheated oven for 35 to 40 minutes, until golden and soft. Remove from the oven and leave to cool down for about 5 minutes before serving. 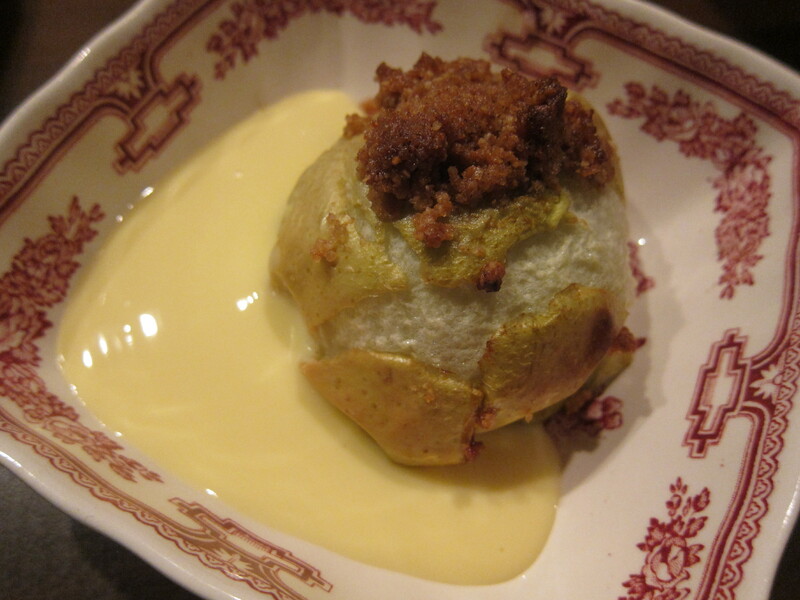 Serve it meanwhile still warm with custard or cream, also spoon over the lovely caramelised juices from the pan! 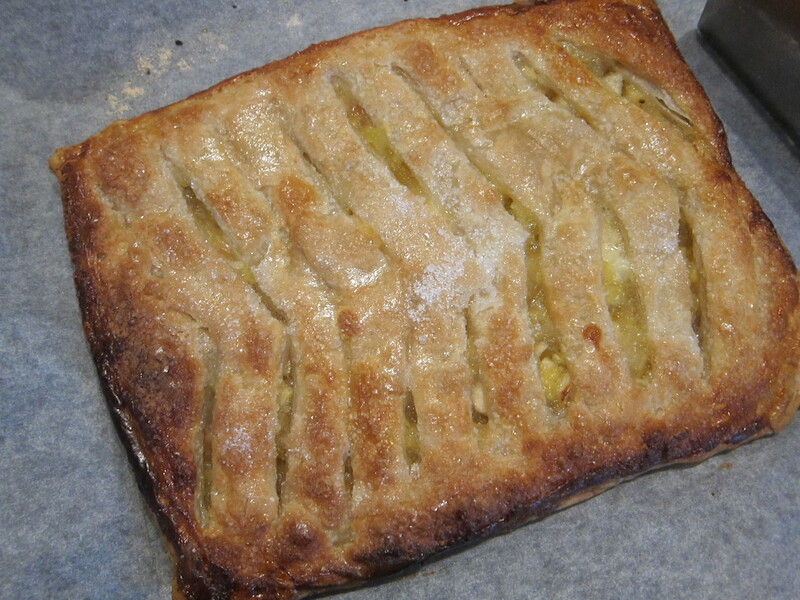 We had a couple of our friends coming for tea and had not much time to bake anything, luckily, I had a ready puff pastry in a fridge and apples, which did remind me about James Martin’s recipe I’ve recently seen on TV. 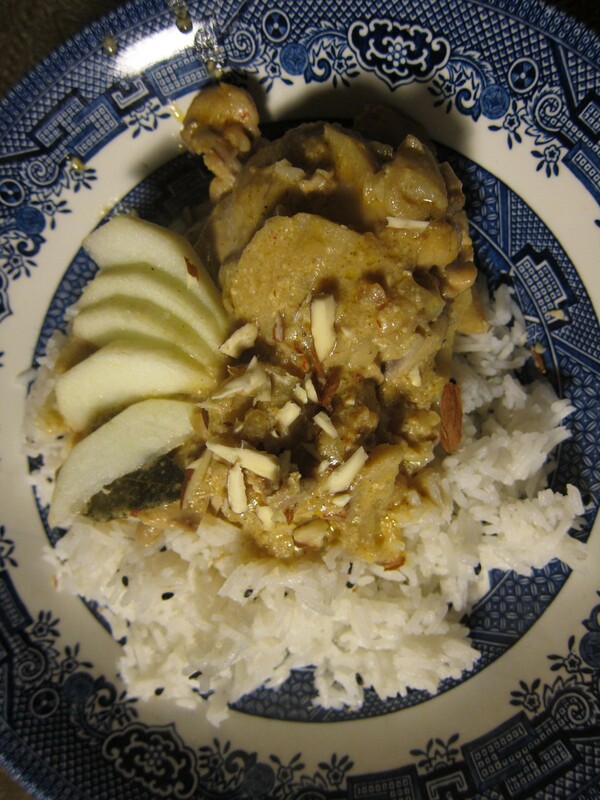 It suited perfectly for this occasion, – very quick to make and really delicious. 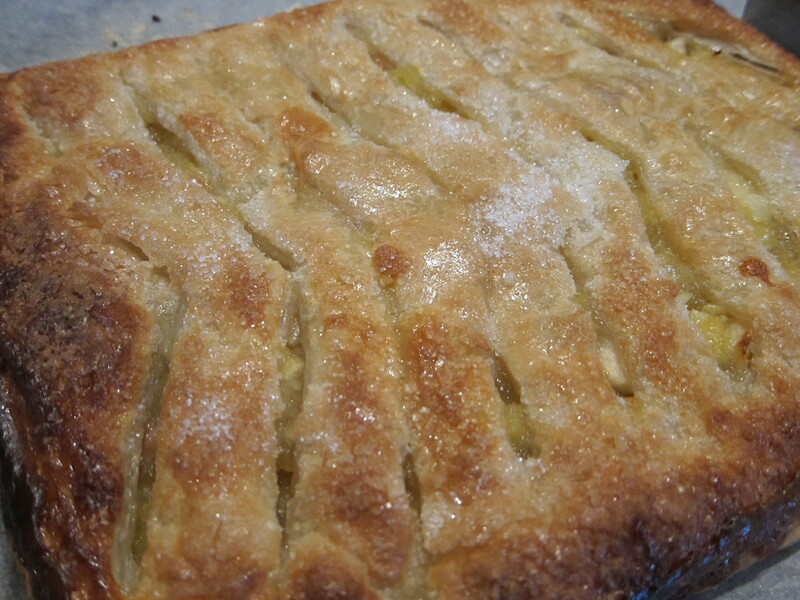 Tart apple filling, marzipan layer and crispy pastry is a perfect combo! This quantity of ingredients will make a rather big slice which easily will provide about 6-8 portions. 1. Preheat the oven to 200C/180 Fan. 2. Heat the apples, 3 tablespoons of sugar and 3 tablespoons of water in a saucepan over a medium heat. Bring the mixture to the boil, stirring well, then cover and reduce the heat until the mixture is simmering. 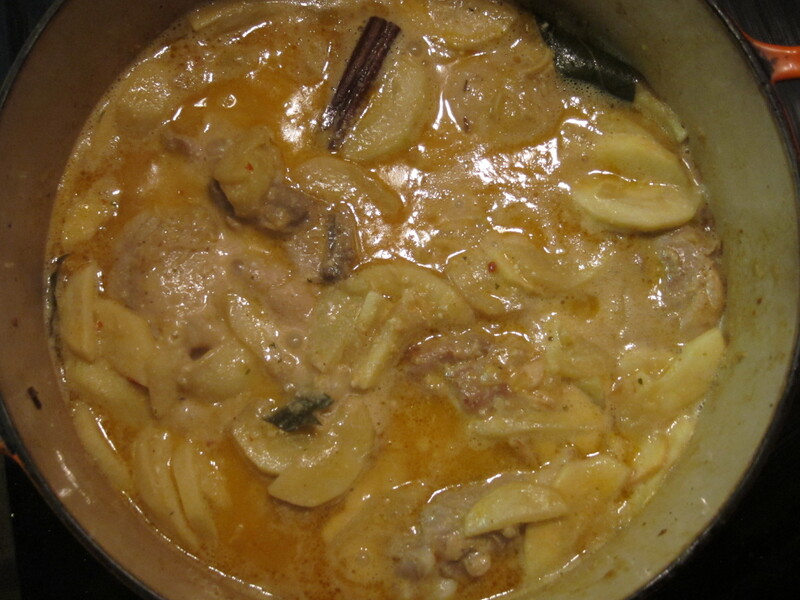 Continue to simmer for 3-5 minutes, or until the apple has softened. Cook until the apple has completely broken down to a purée, then remove the purée from the heat and set aside to cool. 3. Place one sheet of puff pastry onto a baking tray lightly greased with butter. Lay the slices of marzipan (or I prefer to grate it) on top of the pastry to cover, leaving a border of 2cm all the way around. 4. 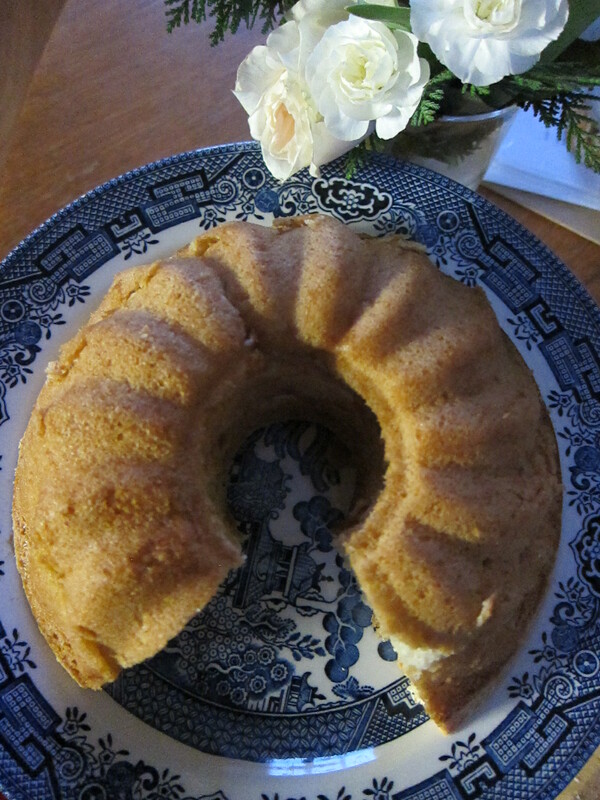 Spread the cooled apple purée over the layer of marzipan, then brush the pastry border with a little of the beaten egg. 5. Fold the second sheet of puff pastry in half lengthways, then carefully score the pastry from the folded side towards the cut side at 1cm intervals down the length of the pastry, leaving 2cm intact at the cut side of the pastry. 6. Unfold the scored pastry and lay it exactly on top of the apple-covered pastry, then crimp the edges to seal the two sheets of pastry using your fingers. 7. Trim the edges of the pastry and brush the top of the Apple slice all over with the remaining beaten egg. Sprinkle the top with demerara sugar, then bake in the oven for 25-30 minutes, or until the pastry has risen and is crisp and golden-brown. I like this time of year with apples being plentiful and the weather turning chillier. 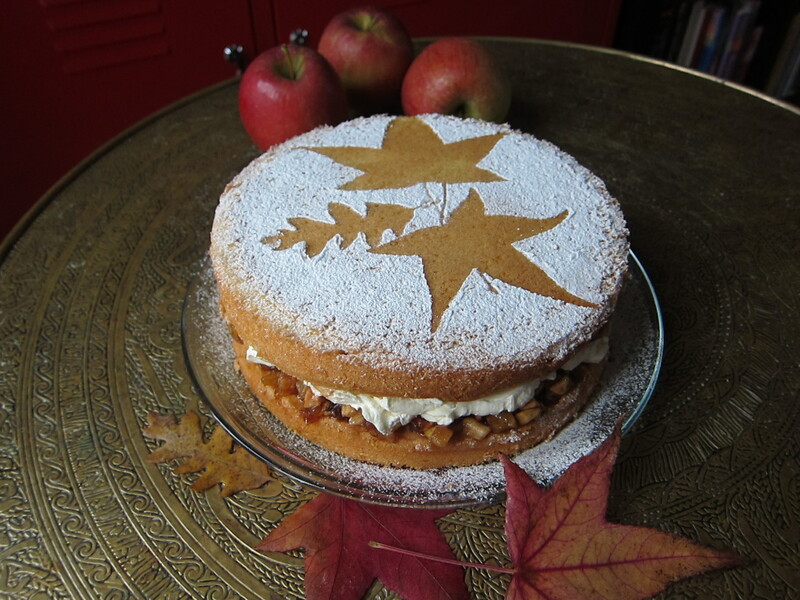 I wanted to make a cake for my lovely friend Amy, soon-mum-to-be, something for her to indulge on a cold autumn’s evening. 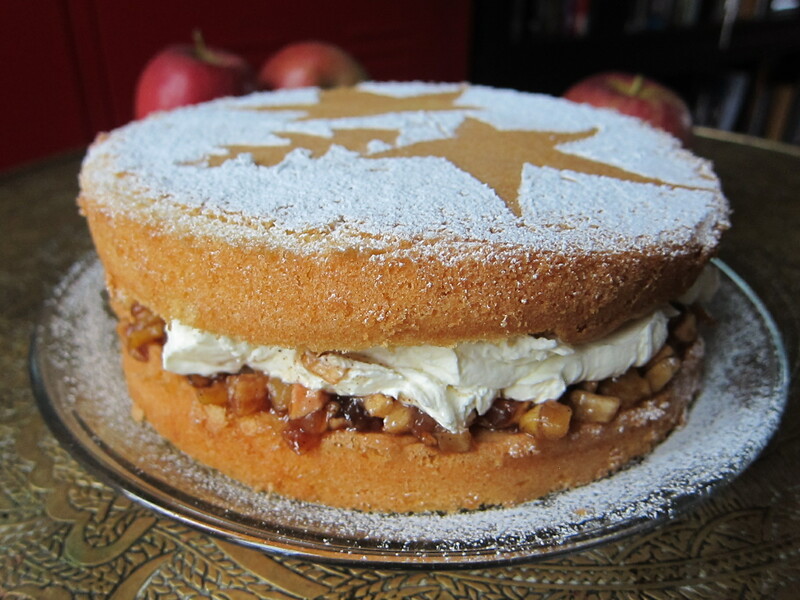 The combination of toffee taste and apples was a lot on my mind recently, had a spare hour on Sunday and I decided to improvise a little. 1. Pre-heat the oven to 180°C/Fan 160°C. Grease two sandwich tins then line the base of each tin with baking parchment. 2. Measure the butter, sugar, eggs, flour and baking powder into a large bowl and beat until thoroughly blended. Divide the mixture evenly between the tins and level out. 3. Bake in the pre-heated oven for about 25 minutes or until well risen and the tops of the cakes spring back when lightly pressed with a finger. 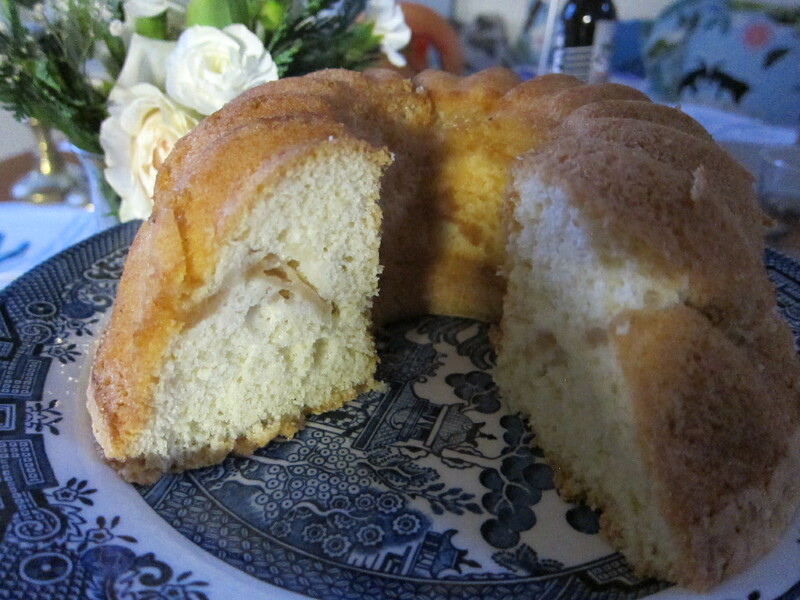 Leave to cool in the tins for a few minutes then turn out, peel off the parchment and finish cooling on a wire rack. 4. For the filling, finely chop the apples, put in a frying pan together with sugar, cinnamon and butter and cook until caramelised, stirring occasionally (make sure apples don’t burn) until the mixture caramelises. Let it cool. Meanwhile whip the cream.